Some students and parents are demanding the La Jolla High School principal be fired after a cartoon of caricatures with derogatory content on their clothing was published in a school newspaper. 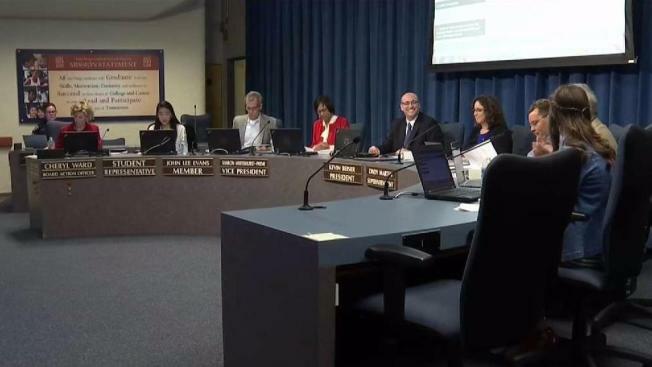 The San Diego Unified School District (SDUSD) board heard complaints during public comment at Tuesday night's meeting. Outrage and anger expressed by the students and parents that came to complain filled the auditorium. The cartoon, whether intended as satire or not, is no laughing matter to the students and parents of the Barrio College Institute. "Racist, offensive and downright disgusting," is how one speaker described the cartoon. "I was truly disgusted seeing this cartoon at La Jolla High" student Bryan Kennedy said. The Institute is a program for underserved kids, most of them minority students, from schools all over the district. Among them, is La Jolla High school sophomore Allison Gutierrez. "It's already a struggle to have to face these stereotypes as a student and to have them put out there for everybody to see it's really hard," Gutierrez said. Adelita Jasso's son is also a sophomore at La Jolla High School. "I would like him never to put anybody down and always be proud of who he is," Jasso said. Last week Superintendent Cindy Martin, and the La Jolla High principal Chuck Podhorsky issued an apology to the parents of the district, saying the publishing of such a cartoon was an error in judgment. Board Trustee Michael Mcquary, who represents La Jolla High and District C, is equally outraged. McQuary asked the superintendent for a full investigation. "To deal not with the specific situation and the individuals involved but also digging deeper where the culture what is the school climate is,” McQuary said. The educators directly involved in approving the publishing of that cartoon have not yet been identified. We know there is an advisor to the newspaper and an editorial process in place. Superintendent Cindy Martin declined to comment on the investigation underway. The board president said it is a top priority.